Governor Charlie Baker spoke to reporters as he unveiled his state budget proposal during a news conference on Jan. 23 at the Statehouse. The Baker administration on Wednesday unveiled a new plan to tackle the soaring cost of prescription drugs in the state Medicaid program by negotiating prices directly with drug makers and subjecting expensive drugs to state oversight. Pharmaceutical companies immediately objected to the proposal, while consumer advocates and insurers welcomed it. 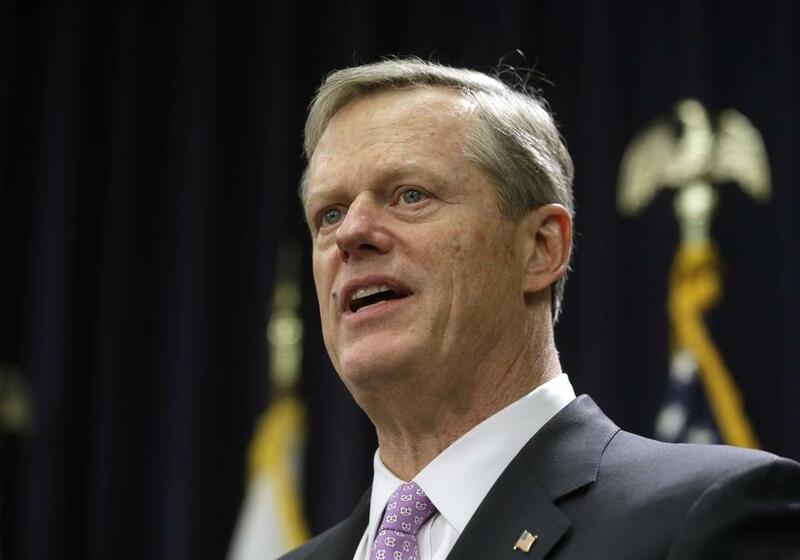 Governor Charlie Baker, as part of his annual budget plan released Wednesday, is seeking authority to negotiate lower drug prices for the state Medicaid program, or MassHealth. Without a change in state law, administration officials said, they cannot require pharmaceutical companies to come to the negotiating table. If the negotiations are unsuccessful, administration officials want to refer high-cost drug makers to the Health Policy Commission for further oversight. The state commission currently serves a watchdog role focused on hospital costs, not drug prices. Under Baker’s plan, the commission could require drug companies to explain and justify their prices in documents and at public hearings. If the commission determines a drug price to be unreasonable or excessive, it could refer the drug maker to the attorney general’s office for investigation under state consumer protection law. MassHealth insures about 1.86 million poor and low-income residents. Drug spending in MassHealth has nearly doubled to $1.9 billion since 2012, administration officials said — far exceeding spending growth on hospital care and other services. Administration officials said their proposal is likely to affect about two dozen expensive drugs. Administration officials said that by negotiating with drug companies and making other changes they would save $80 million in the next fiscal year, which begins July 1. Robert K. Coughlin, president of the Massachusetts Biotechnology Council, said MassHealth already receives discounts on prescription drugs and should not be targeting drug makers. “Governor Baker’s proposal to force certain drug manufacturers to pay additional, supplemental rebates on incredibly effective drugs that MassHealth deems too expensive sends a message across the industry that government is going to punish success and that only it can be the final arbiter of drug pricing,” Coughlin said in a statement. A national industry group, Pharmaceutical Research and Manufacturers of America, or PhRMA, also slammed Baker’s budget proposal. “Dangerous price controls and other proposals included in the governor’s budget could limit a patient’s access to the treatments and medicines they need,” a PhRMA spokeswoman said in a statement. The governor’s plan for MassHealth, along with the rest of his budget, needs approval from legislators before it can become law. MassHealth represents the single biggest piece of the state budget, though the costs are shared with the federal government. Overall, program spending would increase slightly in the next fiscal year — 0.1 percent — to $16.5 billion, according to the governor’s budget plan. Baker’s plan to slash costs in MassHealth differs from what he proposed last year: to exclude certain expensive drugs from coverage, and to move 140,000 low-income adults off the program and onto subsidized private health plans. State lawmakers and federal officials rejected these ideas. Administration officials said their new plan for MassHealth would not exclude any drugs and does not require federal approval. They also dropped their proposal to shift people off the program. Amy Rosenthal, executive director of the consumer advocacy group Health Care For All, said the governor’s new proposal is “definitely going in the right direction. The Massachusetts Association of Health Plans, which represents insurance companies, also supports Baker’s plan.